Helps to gain control over the senses through body exercises. This ancient mother of all the exercises offers a wonderful possibility for good health, long life and happiness. The combination of the body-exercises, breathing techniques, intentional imaginations and meditation based on PEACE are the chariot for you to go into a complete new and wonderful life. Especially recommended for people with the well known “back pain”. “Hatha” derives from the Sanskrit words “ha” (sun) and “tha” (moon). Hatha Yoga is one of the ancient disciplines to attain divine consciousness and self-realization. The word “Yoga” is derived from the Sanskrit root “yuj” (to yoke / yoke your mind). Given by the glorious primal (original) Guru Sri Adinath – Lord Shiva Hatha Yoga shines forth as a straight way for those who wish to ascend to their highest levels. 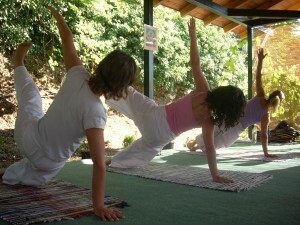 Hatha Yoga is also known as the science of purification. We consider Hatha Yoga as the preliminary practice of Tantra, Raja Yoga, Kundalini Yoga and Kriya Yoga. YAMA: restraint, especially external control, like no injury and continence.